of Battery Life From its sleek appearance to its wealth of features, the Eee PC™ 1001PXD is designed to be the affordable portable computing companion of students and professionals. Featuring a 10.1” screen and weighing only 2.8 lbs with battery, the netbook is easy for users to travel with. Users can stay productive all day, thanks to an ASUS Super Hybrid Engine that works with a power-saving Intel® Atom™ N455 processor to deliver up to 8.5 hours*(1001PXD-MU17) of battery life on a single charge. High speed wireless 802.11b/g/n keeps users connected while on-the-go and a built-in 0.3 Megapixel camera fulfills the video-conferencing needs of professionals. The netbook also offers an ergonomic keyboard for uncompromised comfort and an unlimited 60 day trial of ASUS WebStorage**, which permits users to sync, share, and back up files to a secured Internet database. 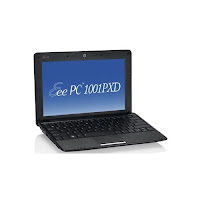 Related Posts of "Asus Eee PC 1001PXD drivers"